The Microcurrent is used at a sub-sensory level to rejuvenate the skin and requires no recovery time following the procedure. 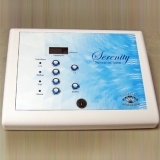 The Serenity microcurrent system will safely and effectively improve the health and appearance of the skin by increasing the natural production of elastin, collagen and circulation. Younger clients seek microcurrent rejuvenation for prevention of some of the aesthetic effects of aging. Mature clients seek the treatment for the rejuvenative qualities their skin will gain from the treatment. A series of microcurrent treatments can provide: improvement in muscle tone in the face and neck; Reduction or elimination of fine lines and wrinkles; Lifting of jowls and eyebrows. See the before and afters. 75 minutes. $135 - A series of treatments is recommended for best results. Anti-Aging - Look light years younger with the help of LED Facial. 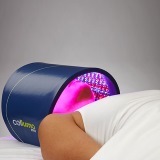 Combination of LED therapy and Oxygen infusion to reduce signs of aging, hydrating and toning the skin. The treatment starts by using fruits enzymes peel to shed the dead cells and encourage the new cells to take over. Follow by extraction then LED therapy to stimulate fibroblasts to increase collagen and elastin production. A facial massage with power serum hyaluronic and peptide for deep penetration. Then a customized mask is combined with an oxygen facial therapy gently sprays oxygen around your face to deliver nutrients and antioxidants into your skin for optimal results. This treatment is not recommended for someone who is pregnant or nursing, subject to epilepsy, using medications causing light sensitivity or having metastasis. Exfoliation using the original Crystal Free DiamondTome Wands safely removes the dead, outer layer of skin by gently exfoliating the skin with natural diamond chips, while vacuuming the dead skin cells away in a clean and controlled manner. This clinically proven treatment leaves a smoother texture and promotes the growth of healthy new skin cells. After exfoliation you skin will need an additional therapy using serums, such as vitamin C, skin lightening, acne, or deep moisturizing to complete your treatment. The new Hydro Wand infusion system allows for deeper product penetration. Perfectly formulated and designed for optimum skin penetration, the HydroSerums are an effective way to improve skin texture and appearance. 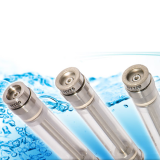 The HydroSerums are available in Acne, Deep Hydration, Even Tone and Vitamin C.
This treatment is not recommended for people who have deep scars, undiagnosed lesions, a recent herpes outbreak, warts on the face, skin cancer, active acne (stages 3 and 4), sunburns or active rosacea, eczema, or unstable diabetes. 65 minutes. $150 - A series of treatments is recommended for best results. Exfoliation using the original Crystal Free DiamondTome Wands safely removes the dead, outer layer of skin by gently exfoliating the skin with natural diamond chips, while vacuuming the dead skin cells away in a clean and controlled manner. This clinically proven treatment leaves a smoother texture and promotes the growth of healthy new skin cells. Combat the visible signs aging. Replenishing lost oxygen and moisture are pumped into the skin through the use of a high powered airbrushing tool and an anti-aging serum, leaving the skin nourished and refreshed. The treatment includes exclusive milk collagen mask and enzymes. 65 minutes. $170 - A series of treatments is recommended for best results.